We know that more than three quarters of the value of all giving in the United States comes from individuals and their estates. Yet we mostly overlook the philanthropic benefit these individuals receive from giving. Here the tax deduction doesn’t count: it mostly obscures the deeper benefit of giving by covering it with a financial veneer. What really overshadows the personal joy of giving, though, is the trend to systematize giving by focusing on the social good that does not include the giver in the calculus. We seek to subject giving to impact formulas that will do for giving outcomes what income statements do for financial investments. But few impact metrics I’ve seen focus on the benefits to the donor, other than occasionally showing where he or she ranks compared to peers in terms of financial generosity. There are, however, enlightened donors who reflect on the pleasure as well as the spiritual and communal enrichment they experience through their generosity. A self-regarding approach isn’t necessarily less rigorous or easier. It can be equally as thoughtful as the trendy, policy intensive approach that seems to suggest that every family should have a virtual think tank to craft and evaluate its strategic impact in the world. For example, one of the hallmarks of our curriculum at the Lilly Family School of Philanthropy is to guide students through a philanthropic autobiography through which they synthesize, evaluate, and present the past, current, and future of philanthropy in their lives. In the laudable effort to get more bang for the donated buck it is important not to forget the humanity of the donor, the individual involved in the creative act of giving. There are risks that come with deeper individual involvement as one exposes oneself more intimately to being affected by giving. Consider the somewhat surprisingly personal way in which donors use one of the sector’s most influential rating tools. Charity Navigator CEO Michael Thatcher visited our school recently, and we welcomed the expansive and critical vision of ratings we discussed as his team crafts the next phase of this influential guide for many donors. Charity Navigator was founded in response to a scandal involving financial fraud at a charity, and we learned that the main reason donors consult Charity Navigator today is still to make sure they are not being swindled by the organization they want to give to. The fear of betrayal reveals an intimacy in the act of giving that is precious, standing in stark contrast to the quest for formalization and systems to gauge impact and document accomplishment. If I get taken for a ride in a commercial deal or encounter a corrupt public official, I won’t take it too personally. But when my gift is willfully misused it can make me feel personally violated. If my intent was to feed a child and instead I learn that the money was used by a charity’s staff member to buy luxury goods, it approaches the kind of betrayal and loss one feels when there is a falling out between parents, siblings, or spouses. This sense of betrayal motivated Charity Navigator Founder Pat Dugan to start the watchdog. It makes sense that the motive to avoid misplacing something as personal as generosity drove its rapid rise to prominence. It is not only Charity Navigator that seeks to protect us from waste and its more emotionally wrought cousin, betrayal. We all want our giving to have impact and make a difference. The current profusion of approaches and systems to achieve and measure impact is remarkable and it is keeping our students and faculty busy trying to account for all the ways being invented to make giving more effective and efficient. But what we should also remember is the fundamental importance of how the donor is affected by giving. Unless we are to move toward regulating and prescribing giving to become a version of voluntary taxation, we should acknowledge that not all of the important purposes of giving have to do with the intended recipient. And remember that donors are not only the elevated few. More people give than vote. Research done by our professor Sara Konrath demonstrates the tangible health benefits of giving, and we know from legions of accounts about the deep satisfaction people get when donating. As we are in the season when giving surges we should celebrate its deep personal rewards while also acknowledging its deep personal risks. Philanthropy is more than policy making by other means. It also involves character making and community making that brings with it more emotionally laden engagements. When it goes awry waste becomes betrayal. But when it goes well it transforms relationships and people, making friends and family out of connections and acquaintances. Giving does not only advance the public good because it benefits others. The public good is increased when givers themselves enjoy the benefits of giving. People who give tend to be more active, engaged, healthy, and happy. Giving itself is also a social good because of what it does for the giver. So worry less about the impact your donations will have on the world at large and focus some of your energy on how giving affects you. Giving to education, and especially higher education, continues to outperform giving to most other subsectors due to the compelling case for new knowledge, economic growth, reduced student debt and easier access regardless of income. FOR ALL of these reasons and many more, the Bicentennial Campaign for the Lilly Family School of Philanthropy serves to meet these needs through three major goals: training the next generation of nonprofit leaders; seeding research and discovery; and convening intellectual leaders to drive new insights in philanthropy. The school’s goal of $50 million is lofty but our sights are high to match our vision as the first-in-the-world school of philanthropy. In order to maintain our first-mover advantage we will need to compete with more than 50 institutions that offer competitive scholarships to attract and retain the best students. 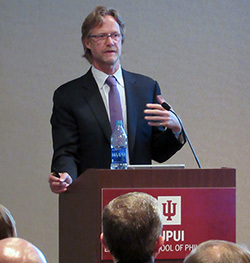 We will need to endow faculty support to bring new scholars to Indianapolis who in turn attract top talented students. We will need to continue to push research that identifies emerging trends, tests conventional beliefs and practices and provides insights into giving. And we will need to continue to act as a catalyst to gather thought leaders in order to fulfill our school’s and our community’s role as the leading authority across the globe. Today we stand at the mid-point of this seven-year comprehensive campaign which ends December 31, 2019 to mark Indiana University’s 200th anniversary. While we are one of the youngest schools in the Indiana University system, we are founded on 30 years of scholarship by pre-eminent leaders and faculty—past and present—who challenge and shape the next generation of academic leaders and drive innovation. We will be challenged to triple our giving from $2.5 to $8 million per year to reach our goal. To meet this mark we have assembled a top-notch development office, and continue to build a legacy of leadership volunteers by expanding our board of visitors and engaging our more than 700 alumni, as well as our friends around the world. Two years ago, Lilly Family School of Philanthropy undergraduate student Lacy Ross and her family experienced unimaginable heartbreak. Lacy’s sister Maddie unexpectedly passed away at the young age of 19. Born with spina bifida, Maddie confronted trial after trial in her life, and although she faced great adversity, she became known for her illuminating smile that inspired and uplifted people everywhere she went. Maddie’s smile had a tremendous impact, and Lacy and her family wanted to encourage everyone to share the joy she exuded on a daily basis. Lacy has helped to grow “Maddie Smiles” and has led the organization in many fundraisers and events to raise awareness for spina bifida and for kids at the Riley Hospital for Children. 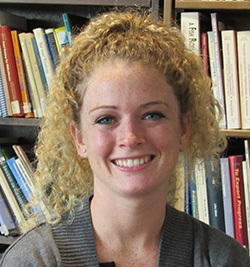 She looks forward to earning her degree in philanthropic studies and plans to apply her education to a career coordinating events and fundraisers. 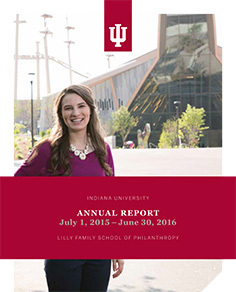 Students often choose the Lilly Family School of Philanthropy because they want to make the world a better place. Lacy is one of those students, and she is already making a difference in her community while learning what it means to lead a cause and how to leverage her Lilly Family School of Philanthropy education to create even greater impact. With Maddie as her inspiration, Lacy hopes to start a movement that will recognize Maddie’s contribution to her life – and how kindness can contribute to the lives of others. To learn more about Maddie Smiles visit their website or their Facebook page. We invite you to make a contribution to scholarships that support Lilly Family School of Philanthropy students like Lacy who are creating positive change. 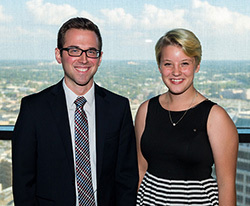 Congratulations to graduate student Josh Moore and undergraduate student Abigail McIntyre, winners of the David Nathan Meyerson Prize for Leadership & Giving. The prize lets students dedicated to helping people meet their needs compete for a nonprofit exploration travel scholarship and funds to grant to nonprofits. Moore will use his prize to help increase access to education, while McIntyre’s plans include increasing awareness of the need for adoption. The competition, held October 6 in Indianapolis, was in honor of David Nathan Meyerson, exemplifying those who are deeply committed to helping people in need. It was created by philanthropist Mort Meyerson and the David Nathan Meyerson Foundation. Students participated in an essay contest and competed to develop and deliver presentations before a panel of judges in order to be considered for the prize. Richard Trollinger, M.A. ’02, is the 2016 recipient of the Lilly Family School of Philanthropy Distinguished Alumni Award. The vice president for college relations at Centre College in Danville, Kentucky, Trollinger is also an author and one of the nation's top experts in educational fundraising. While at Centre College, Trollinger has positioned the college as one of the nation's leaders in philanthropic giving. In a recent campaign, Centre exceeded its initial fundraising goal of $120 million by more than $49 million. 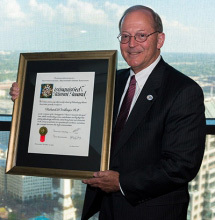 His efforts also produced a 49 percent alumni participation rate, among the highest giving percentages in the country. He credits his success in part to involvement with the school. "The work done by the Lilly Family School of Philanthropy contains the power to change the world and, most importantly, to change the world for good," Trollinger said. "It is indeed an honor to be associated with an institution that sponsors such important research, that teaches students to be both scholars and practitioners, and that sustains its alumni with information and inspiration throughout their careers." 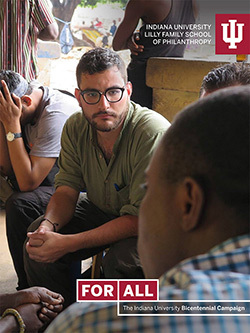 A host of new offerings for practitioners and students, major grants that allow us to expand upon our work, research that helps address crucial issues, and students whose impact is recognized nationally—these are among the accomplishments highlighted in the school’s 2015-2016 annual stewardship report. You make them possible, and we are grateful for your support.